We have awful water in North Las Vegas. When we moved to a new house in 2007 our friends told us about LifeSource. We like the water now, no problems with our system, water taste good. Now we recommend the Lifesource system to our friends. We love our LifeSource Water! We have been thrilled with our LifeSource Water. Having delicious, clean water from every faucet that is free of the chlorine taste and smell we experienced is a real treat. 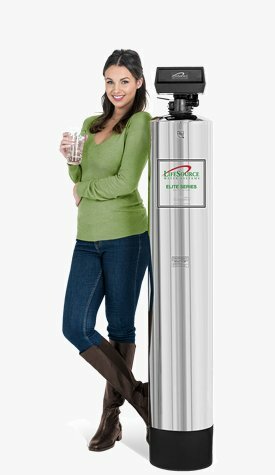 Since installing the LifeSource water filter, we have stopped buying bottled water, a cost savings and a benefit to the environment. I am happy that my family and I now are washing ourselves, our clothes, and our dishes in water free of harsh contaminants - my hair has never been cleaner or more manageable! 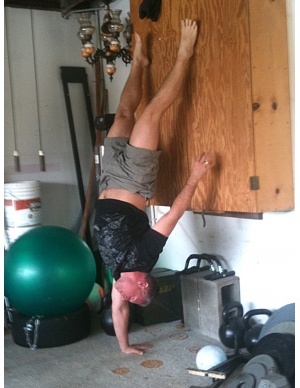 These benefits are all effortless, as there is no maintenance. 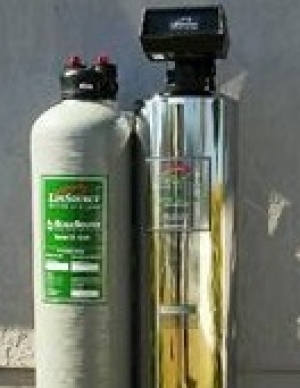 I highly recommend LifeSource water filters! I definitely love my LifeSource ! After living in my new home for a few months and experiencing laundry that would practically stand on its own, stains in my dishwasher and on my stainless steel dinnerware....and unpleasant odor and taste in my water...I discovered LifeSource ! Love It !! Life is Good !! We know just how vital water is to life. Not just any water, but clean fresh water. 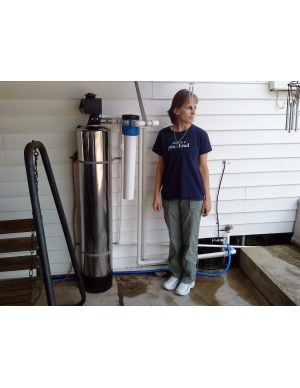 We absolutely love of water source system. People ask why our water is so good and we explain why. Also, we watch the Rose Day Parade every year and I truly appreciate your float and sponsorship to the parade. We have a new baby and it is so important to us that his water is clean. 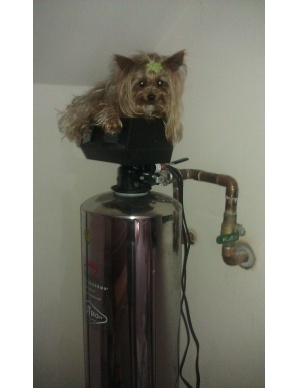 Sometimes Maggie loves the LifeSource so much she just wants to keep it company. Seriously, I love our Lifesource because now our clothes are white again. We have so much iron in our water! Once, before Lifesource, my husband was getting ready for a business trip and I put all six of his white shirts in to wash at once. Somehow, our pipes "burped" and they were totally orange. I had to make a special trip to the mall to get new shirts. That did it. I started shopping for a system to stop the insanity and I found Lifesource. We have been exceptionally happy since then. I have never had another problem with off-color whites. Tap water = BAD! LifeSource Water = GOOD! • Our tap water in San Diego looks, smells, and tastes bad. Well, to be honest, we're not positive about the first two, but it definitely does taste bad. Now that our water runs through our LifeSource system it looks, smells, and tastes good! 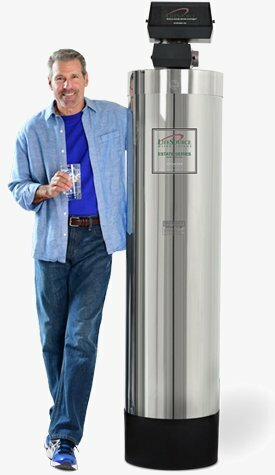 • We were tired of replacing expensive kitchen and bath faucets after only a few years; the unfiltered tap water was ruining them. When damage from the 2007 wildfires prompted a complete home remodel we replaced all of our faucets and installed our LifeSource system and the faucets still look like new today! • Our cats love the water. One of our cats, Berkeley, insists on being 100% hydrated, 100% of the time. We like knowing that he is full of good water now, not bad water! • Tap water = BAD! • LifeSource Water = GOOD! 1. We love the way our water tastes!! 2. We love that we shower every day in purified water - great for our hair and skin. 3. 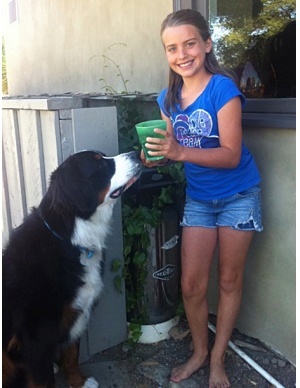 We love knowing our big dog, Koda, is getting bathed in the best water possible, he thanks us every day! 4. 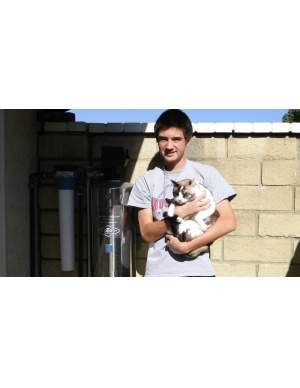 We love that even when we hear Koda,drinking out of the toilet - we know he is drinking good water! 5. We love getting up in the middle night and feeling thirstyand knowing we can drink right out of the bathroom faucet - HUGE payoff not having to walk to the kitchen and grab a bottle of water!! 6. I love when I am having a nice dinner at my home and my guests give me this odd look when they see me filling their water glass straight from the sink, I smile, and say "It's purified, it's LifeSource"
I recently moved. 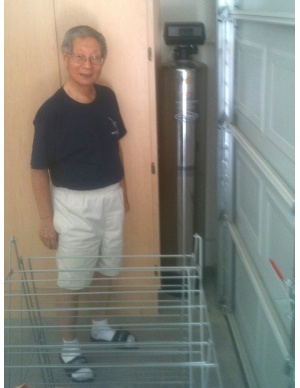 One of biggest priorities was getting my LifeSource water filter installed here at my new home. 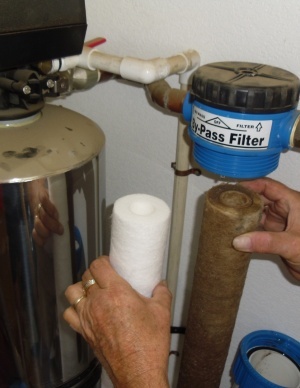 I've had the filter for over 7 years now and during that time I've enjoyed maintenance-free service and the best water anywhere in the world. 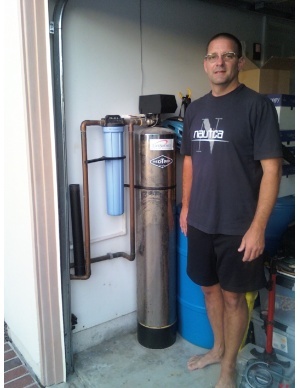 I have to thank Richard Benjamin, a LifeSource factory representative, for his excellent work moving my filter and installing it in a professional manner. So, I'm spoiled now. I can't live without my LifeSource water. We have had our system for 4 wonderful years. 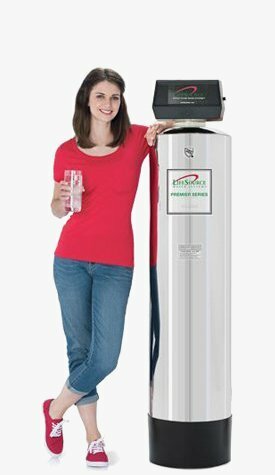 I wanted the LifeSource system to save my aching back after 8 years of lifting 40 pound salt pellet bags for the water softener and 5 gallon water bottles to the cooler. 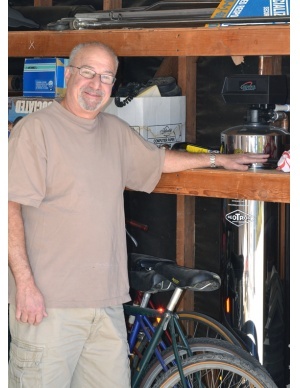 What an instant money saver as soon as the LifeSource was installed! Now I only have to refill a small one gallon bottle for the water cooler. 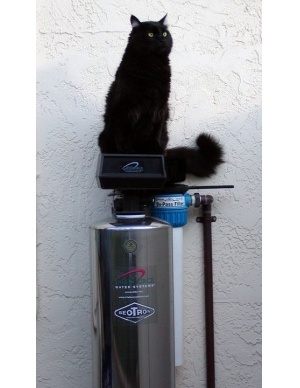 We get great tasting water straight from the tap and my kids and cats love it! I would highly recommend this system to everyone. 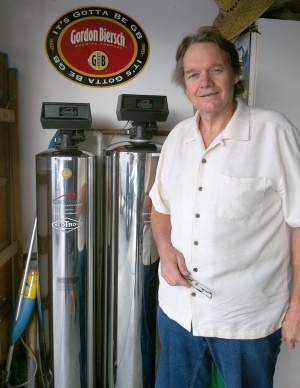 I bought my LifeSource Water System in Calif., prior to moving to Fort Mohave, AZ. Good thing I did as after moving here I found that the water supplied was very hard with calcium and magnesium minerals with a grain reading of "58". The water was so hard it was difficult to get suds from a bar of soap when washing one's hands. After installing the LifeSource Water System, plus a LifeSource soft water system (just for the hot water), I had my water tested again and the grain reading dropped all the way down to 26 grains. 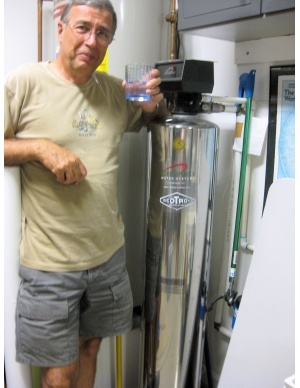 Still a little hard, but no problem, and the LifeSource Soft Water System made "sudsing" no longer a problem. 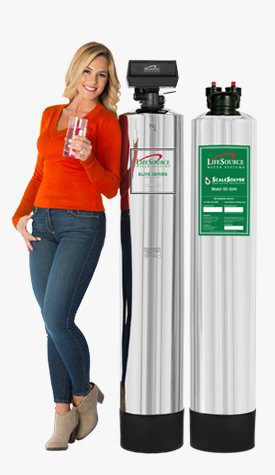 I have my LifeSource Water System for over ten years and it continues to work wonders. 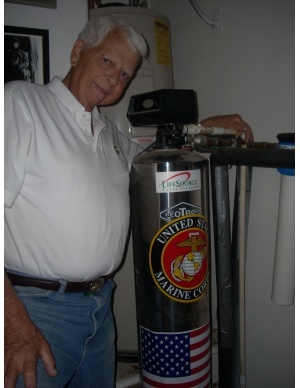 Have shown and explained my LifeSource Water System to many of my neighbors and to the professional plumber contractor who installed my LifeSource Water System. 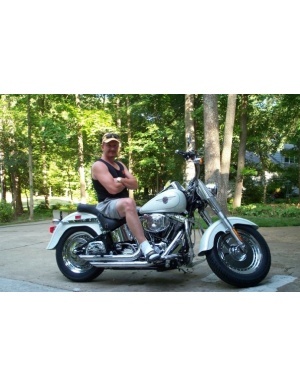 He has since marketed the LifeSource Water System to other clients. 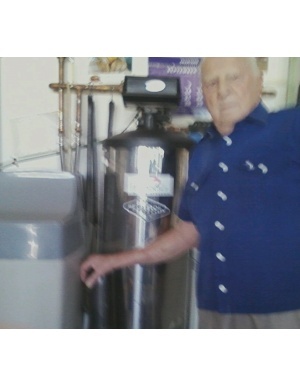 I also have a neighbor who has a daughter living in Calif.and was having hard water problems, so after showing my LifeSource Water System to my neighbor, he explained in detail the benefits of the system to his daughter in Calif. She now has the LifeSource Water System and is very satisfied with it. Thank you "LifeSource"........you saved our "Lives". Have not bought bottled water in two years. After much internet searching I came across LifeSource. The reading more I liked what I read and contacted LifeSource and talked for two days. I decided and after two years have loved it since. I can tell our bad our city water is , the pre filter is really nasty after 4 weeks. So all in all- great product and recommend it to all. It is pretty amazing! Cleans all the water and takes care of my fixtures! lifesource is good for every body! the minute you first try your new system you know! my skin has never felt so nice and my hair has never looked so healthy :> even my dog's coat has never looked better!! if the outside feels so much better you can imagine what it does for the inside! thank you lifesource!!! Now I can drink water from any faucet in the house and get a great glass of water. And the hot water is great for hot tea also. Our fish LOVE LifeSource Water too!!!!!! 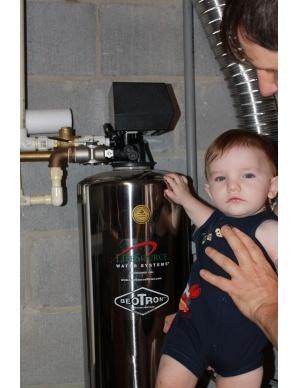 We have had our LifeSource System for over 15 years. Prior to LifeSource System water we could never establish healthy aquariums. Now we have a thriving 180 gallon tank. Not only do we love the water for ourselves, our salt water fish love it too. All we do is add salt to our filtered water and the tank is extremely healthy. Thank you LifeSource water!!! With our LifeSource system we noticed an immediate difference in the taste, smell and "feel" of the water coming from our tap - a very GOOD difference. We feel this was a very good and healthful investment in our "winter" home and speak well of the system to all who ask us about it. 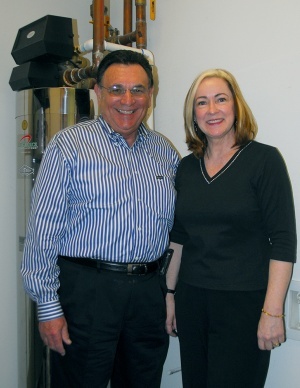 We've had a LifeSource system in our home and our Beauty Career School for many years now. Our students, instructors and our clients really love this water. It is great for our hair and skin treatments. Our hair colors hold better with better color and skin treatments are more effective with the chlorine free water. Also our students and instructors stopped buying bottled water and now refill their reusable water bottles at any of our faucets in the school. Thank you again. I am so delighted ! I hope you see this picture of how LifeSource now looks in my planter. I want to thank you for your attention to my installation. The two man crew said this was the best any one could do. 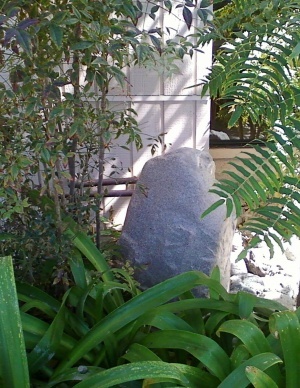 Then the younger, the trainee, suggested I use an artificial boulders designed to cover water meters, etc. This I did; cut out the place for the pipes attached; and it is now a decorative asset instead of my system in out front. Thank you again. I am so delighted! I would be happy to recommend your company; the product is good and the people at the company are dedicated to satisfied customers. 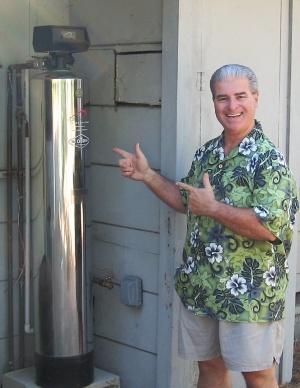 My wife and I bought the system as we wanted clean water, worry free. We didnt want to buy any bottles anymore. We are into natural medicine and very conscious about our health. We are very very happy with Lifesource and recommending to all out friends and family. 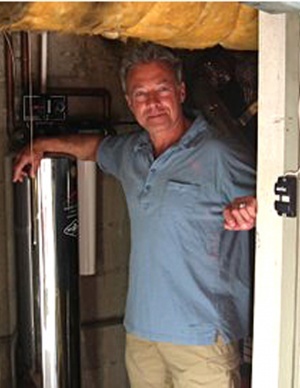 My wife just bought a new home in Malibu and is having a second Lifesource system installed there too. She's overjoyed to be able to start off in her new home with wonderful water. 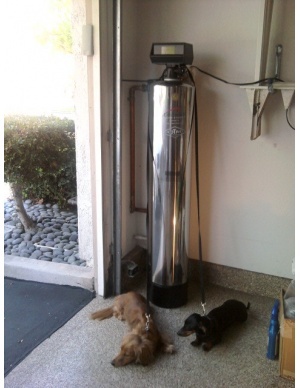 I have 3 LifeSource systems, one home in Oxnard, CA and 2 in the San Fernando Valley. We absolutely love our lifesource, I swear by it. 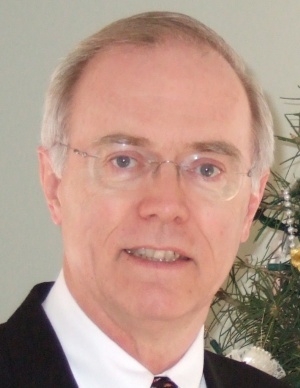 I would be glad to offer a reference to anybody who is interested in lifesource. We are happy with our system because it is low maintenance (no salt). We don't have to buy bottled water anymore. And we were able to hook up our refrigerator ice and water dispenser. Changing our filter for the first time in a while! 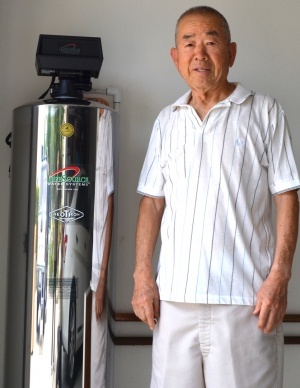 We've had our Lifesource system for over 10 years, and recently, we met you again at a fair, you reminded us about changing the prefilter in our Lifesouce system. I promised to send you a picture when we finally changed it for the first time after many years. We finally got it done and here are the results. It was definitely nasty and dirty and I cant believe we didn't get sick. It is definitely a picture worth a THOUSAND words and you can be sure that we will be faithful at changing it regularly in the future without a doubt. 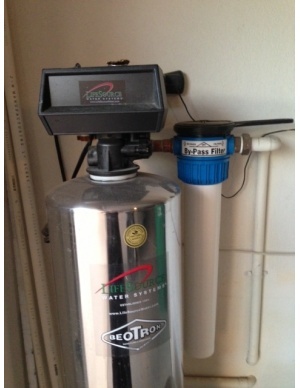 We will love our water and Lifsource system even more than we already do. By the way it is OK to laugh. The whole issue is pretty funny. Water is great, service is great! Water is great, service is great! After I had electrical work done on my home, I noticed that the water didn’t taste the same. I called my LifeSource representative and he immediately came to my home and found that the system wasn’t backwashing due to no power to the nearby outlet. I’ll have my electrician fix that this week. 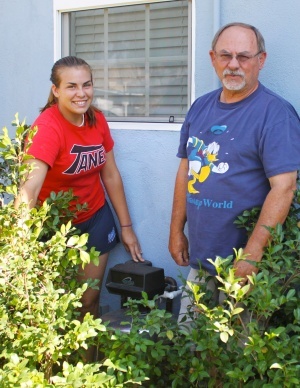 Other than this minor problem, the LifeSource system has been trouble-free since 2009. I'm glad I bought lifesource. The main reason for buying it was I wanted to save money on bottled water. I was really tired of buying it and lugging it into the house. Our skin feels better. The most important thing, my wife Buffy loves it. LifeSource water is great! I had a line ran so I could wash my Mercedes with the filtered water and found that a dry cloth makes the car shine. 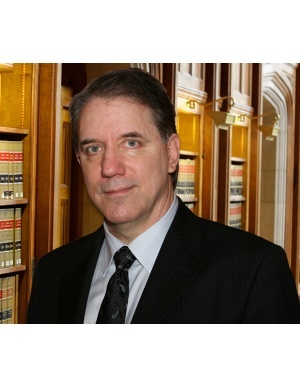 I've referred several friends and clients to LifeSource and will continue to do so. 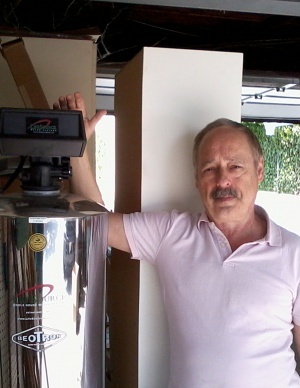 I purchased my LifeSource system shortly after I bought a new home in La Quinta. It was installed prior to any pool or landscaping and over the past 7 years I have enjoyed the best tasting water and chlorine free showers! This is a must for every home. 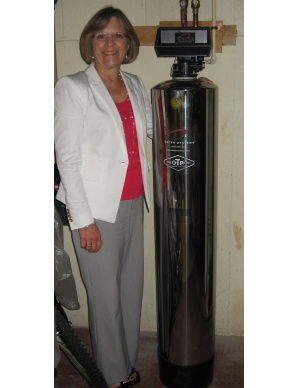 I have enjoyed working with Roxie of Life Source for my homes water filtration system. She explains the systems well and made the decision process easy for me. She is a pleasure to do business with being very product knowledgeable. If you're going to do it, do it right the first time. 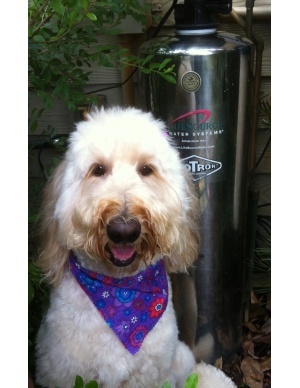 The system was inspected and water was tested after the first year by Roxy and it is in perfect working condition. Thank you life Source for providing me with a great buying experience. DCBE, DeCordova Bend Estates has the absolute worst water in Texas. The LifeSource system works wonders. I just can not even imagine what life would be without my LifeSource. It is great. Even the Real Estate agents tell me that I have the best water in DCBE. I think I also have the only LifeSource system in DCBE.